Ys: Memories of Celceta is an action role-playing game for PlayStation Vita developed by Nihon Falcom and published by XSEED. Players journey through the great forest of Celceta as the hero Adol Christin and his friends in search of his memories and the secrets of the forest. Ys: Memories of Celceta is a retelling of Ys IV, mixing role-playing game elements with a real-time battle system. Players control a party of 3 characters, rapidly switching between them to attack enemies. Players also have access to a wide variety of skills as they explore the forest of Celceta and map out its secrets discovering pieces of Adol's lost memories which serve to reveal more of the story. There are also a wide variety of locations and treasure to be found throughout the forest, encouraging players to complete the map and master their skills by killing monsters. The combat system is rewarding and fast-paced, and engaging is combat is very satisfying because of its simplicity and effectiveness. Players also move in real-time to use skills on enemies, and this is very intuitive because it rewards successful uses of skills to finish off enemies with a reduction in the power needed to cast the skill. The skill system is great because it encourages the player to experiment to figure out which skills are useful in each situation and encourages mastery of them. The boss battles were also very well done, with each boss requiring a different strategy for players to utilize in order to beat. The battles were difficult but with a bit of practice they were very satisfying and never felt cheap. At the start of the game, Adol starts exploring without direction aside from two markers set deep into the forest and equipped with a map that fills up as more of the forest is discovered. This was a fantastic way to begin the game because it made me eager to explore at my own pace further into the forest and find out what other secrets it contained. It's refreshing to see a game that allows its players to go and explore without hand-holding and is extremely effective in the context of this game. This is balanced out with fast travel points allowing players to quickly return to other locations, and this was a welcome addition to remove some of the backtracking required in the story. The soundtrack of Ys: Memories of Celceta is utterly fantastic, with each track adding greatly to the situation it accompanies. There is nothing like hearing some roaring guitar riffs while engaging in combat, and the selection of music is widely varied. The characters are not just your average anime tropes but also exhibit depth through the game. You'll get attached to the characters as you learn more about each of their individual back stories. The localization team at XSEED did a great job giving each of the characters good dialogue which showcases their personalities throughout the story. In addition, each character has their own unique way of fighting which adds to the depth of the combat system and you'll want to spend time playing with each of them as you explore the forest. The story in Ys: Memories of Celceta remains in the background throughout the beginning of the game as the player explores the the forest of Celceta before quickly becoming quite compelling as Adol recovers some of his lost memories. I thought that the story was very strong as Adol regained his memories as they added a layer of depth to the backstory of the game. In addition, it was great learning the backstory of each of the party members as they are introduced. Unfortunately the main story during the last third of the game does not hold up well, it quickly becomes a saving the world plot that hints at being deeper than that but does not live up to this promise. In addition, the conclusion of the story is highly disappointing and feels rushed in comparison to the rest of the game. The graphics in Ys: Memories of Celceta are inconsistent and a little disappointing in comparison to other games of the Vita. They are beautiful at times when Adol is exploring and the vast surrounding landscape is visible, but they suffer significant slowdowns when engaging in combat. The framerate regularly dips when there is a lot of action going on and this is disappointing considering the speed and fluidity of the combat system. Ys: Memories of Celceta features a crafting system where players use raw materials found in the forest to trade for better materials or forge improved weapons. Certain materials would give stat increases to weapons, but these were made obsolete by simply buying better weapons instead of expensively forging new ones. This entire system felt largely unnecessary and poorly explained by the game, making it difficult to understand the purpose of trading items. It would have been better if the crafting system was made either less complicated or was better explained to players. Ys: Memories of Celceta is a great addition to that PlayStation Vita's library, offering players an addictive combat system and a wonderful sense of adventure as they explore through the forest of Celceta. It can be easily played in short bursts making it perfect for the Vita and will help to satisfy the need for a new RPG. While the story is uneven in quality and there are some graphical slowdowns, the strength of the combat system more than balances this out. With one of the best soundtracks available on the Vita and some really likeable characters, you'll want to journey back to Celceta again and again. 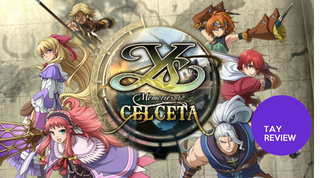 You can find Ys: Memories of Celceta on Amazon.com in the United States and Video Games Plus for those of us in Canada.